God gave Daniel and his friends knowledge and understanding of all kinds of literature and learning. 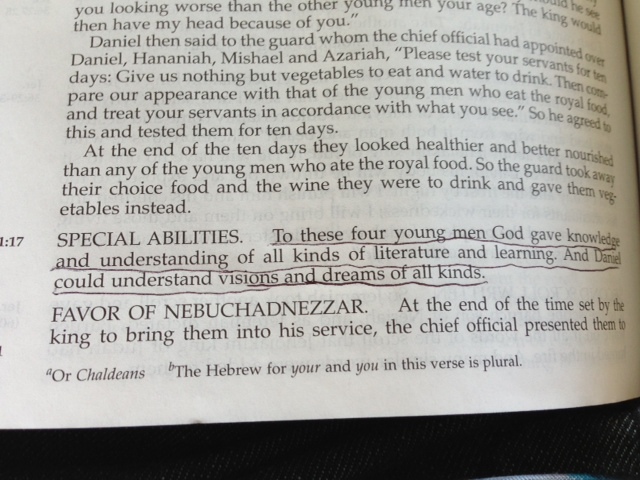 Daniel could understand visions and dreams of all kinds. I don’t know about you, but I’m not looking for knowledge and understanding of all kinds of literature – just the Bible. I have a deep desire to know the Truth and the Truth is only found in God’s word. This has been a core motivation for me as long as I can remember – I just want to know and understand the truth. When I realized that the only real truth is what God says to me through his Bible, it changed my life. I don’t care to understand most of the other stuff that is out there. Show me the Truth, help me understand the Truth and help me apply his Truth to my daily life – that’s all I want. Sometimes the truth hurts and that’s okay. At least it’s the truth. At least it’s not some lie that our culture has made up and tried to pawn off as the truth. And I have been hugely blessed. As I have saught God and his Truth, he has given me knowledge and understanding of his Word. Almost every time I pick it up, God reveals something new to me. And I’m convinced that it’s my problem when I don’t have a ‘a-ha!” moment when I’m reading the Bible – I’m distracted, I’m not listening and, sometimes, I just don’t want to hear it:) When I hear it and understand it, I’m responsible for it, right? The Truth has set me free! And I am free indeed!